So easy, so tasty—and so good for you too! 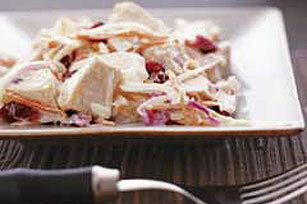 This turkey salad, made with cabbage slaw mix and dried cranberries, is a winner on all three counts. Toss turkey with coleslaw blend and cranberries in medium bowl. Substitute 1 pkg. (6 oz.) OSCAR MAYER CARVING BOARD Flame Grilled Chicken Breast Strips, chopped, for the chopped cooked turkey.